The TWR Porsche WSC-95 n.7 is the winning prototype of the 24 Hours of Le Mans in 1997. 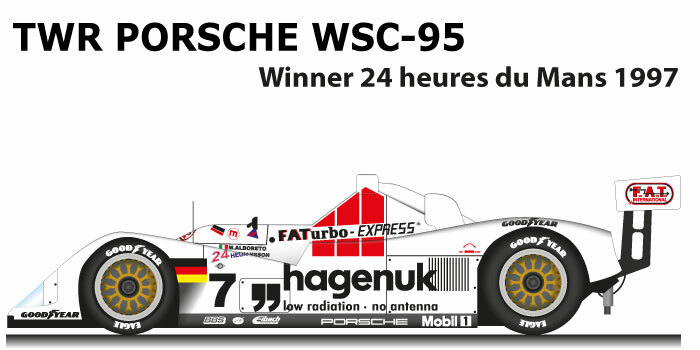 Initially the Joest Team after the success of the WSC-95 in 1996, did not want to participate in the classic french race, but in the end only one car race, participated in the race. Alboreto, Johansson and Kristensen won the 1997 Le Mans 24 Hours with the TWR Porsche WSC-95 n.7. For all three it was the first success at Le Mans. The winning trio arrived in front of the McLaren GT1. The TWR proved very smooth and fast, taking advantage of the withdrawal due to mechanical problems of the Porsche 911 GT1 and the very fast Nissan R90. During the season the TWR Porsche also won the Donington race valid for the ISRS Championship. Transmission: Porsche five speed sequential manual.